As soon as I saw this truck on the shelf at the local Toys R Us, I knew I had to buy it. It looks cool!! The styling is very realistic with the roll bar, high-intensity light bar, and a spare tire on the back. The tread on the tires looks great, too. Better still, the truck comes with a rechargable 9.6V battery, charger, and even a battery for the transmitter -- everything you need to run! 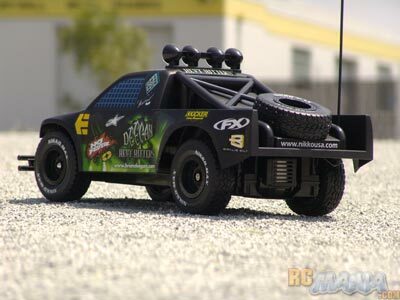 The truck is pretty light in weight, being based on Tamiya's newer high-performance chassis. The controller is dual stick style with slow and turbo speeds on the throttle. With every upside, there's a downside, and in this case the downside of Nikko including the full rechargable battery system is that you need to charge it up before you can run. The first charge is supposed to be extra long, so it's worthwhile to do it overnight or start early in the morning. I really appreciate the convenience of everything being included, though, even the normally pricey 9V battery the controller needs. Out in the dirt or on the street, the truck is painfully slow at the lower speed setting, best for crawling through an obstacle course or trying to navigate down a very narrow trail where precision driving is needed. For normal running, though, I just kept it in Turbo all the time. On pavement the truck is decently fast and handles well. 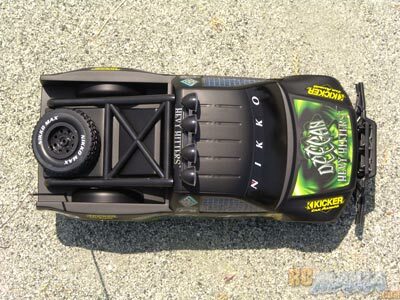 Thanks to the light weight and rear-wheel-drive chassis, you can flick it into a turn, throw it in reverse for a second and pull a quick 90 to 180 degree spin. On dirt, it's a lot slower when it goes over bumps. The treaded offroad tires handle various terrain alright, but the hard rubber compound could be better. If you stay on the throttle when you go through a tight turn, the back will fishtail a bit as the tires lose grip. This helps make tighter turns, but if you want to keep your speed up in a sweeping bend, it can be tough. Backing off to normal speed on the throttle can help maintain control. One great thing is that this Hevy Hitters truck is fast and tough enough to take some jumps and just keep on driving, and it likes to land on its tires, though sometimes the landing is a little bouncy. It's undeniable that this is a great-looking truck, and with the batteries & charger included, it's a good deal, too. It handles very well on the street, and has enough ground clearance and stability to handle some off-road terrain. Because it's a low racing truck and not a monster truck or rock crawler, you can't go over big rocks, but rough gravel and pebble beds are fine. 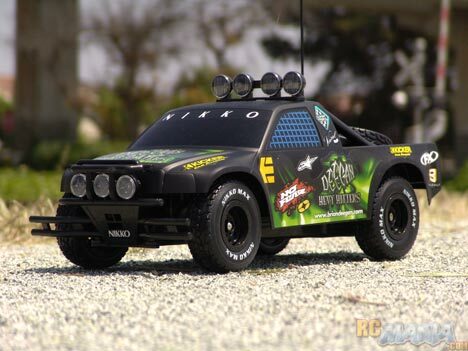 For a young off-road racing enthusiast, the Nikko Deegan Hevy Hitters truck is worth checking out.